If you have been on Golden Gate Ferry or read the news lately, automation has taken over ticketing services for the agency as a cost cutting measure. Golden Gate Ferry purchased self-service ticketing machines utilizing Clipper card technology (similar to Muni metro's vending machines) and also installed Clipper card readers at the entrance to the Sausalito ferry terminal. The new automated machines have made it easier for passengers to purchase their ferry boat tickets and they also get to have fun with the Clipper technology as the tickets issued by the machines are paper tickets compatible with Clipper card readers (exactly like the tickets issued at Muni metro stations). 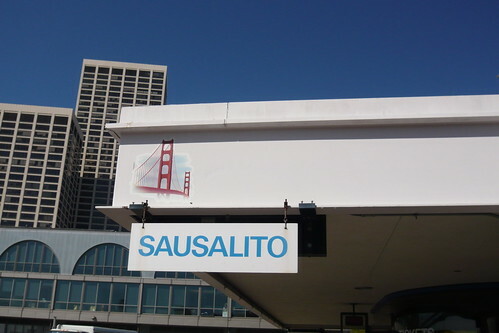 Sausalito's ferry dock is shared by two companies: Golden Gate Ferry and Blue & Gold Fleet, and their final destination in San Francisco is different (Ferry Building vs. Pier 41). On Monday, I was having an ice cream overlooking the ferry dock at Sausalito and noticed a lot of passengers boarding the Blue & Gold Fleet ferry back to Pier 41. Many passengers just walked into the boat and either had a prepaid ticket issued by Blue & Gold or is going to pay to the cashier onboard the boat. But about a dozen people with the Clipper Limited Use tickets issued by Golden Gate Ferry's ticketing machines decided to tag their paper ticket to the Clipper card readers recently installed at the terminal. The crew member from Blue & Gold did nothing to stop those passengers holding the wrong ticket, nor asked passengers what (or if any) pre-paid fare payment they have on hand. Basically, those dozen or so passengers are going to get the shock of their life. In addition to paying $8.25 to Golden Gate, they'll also pay an extra $10.50 to Blue & Gold... a grand total of: $18.75 for a one-way trip! Most of the passengers who did this are those who had bicycles rented from one of the many bike companies around Fisherman's Wharf. They ride the bike through Fort Mason, across the Golden Gate Bridge, down the winding road to Sausalito, and take the boat back to the Wharf. Many of the victims purchased the WRONG ticket, or bought the right ticket (paid round-trip at Golden Gate SF terminal) and boarded the wrong boat to go back. I could play the blame game and accuse our visitors of not paying attention, but as long as people can easily pre-purchase a Golden Gate Ferry ticket at the Sausalito port and board the wrong boat, the problem won't go away. Have the ticketing machines at Sausalito ask every ticket buyer what ferry they are attempting to purchase. If they choose Blue & Gold, tell the rider to just pay on the boat, if they choose Golden Gate, tell the rider to pay now. Put instructions on the back of the paper ticket reminding passengers to only board Golden Gate Ferry and mention it's not valid on Blue & Gold Fleet. The Clipper card readers just beyond the security gate should be only activated when a Golden Gate Ferry employee turns a key or uses a special Clipper card to activate the reader for boardings, then turn-off the devices so it's not accidentally used by passengers of the wrong service or have it automatically make an error sound telling the passenger they are boarding the wrong service. Have the staff at least ask each passenger what their fare payment is prior to entering the security gates to the boat. Make an announcement prior to boarding the boat at Sausalito that Clipper is not accepted. Install clear signage telling people how to pay. Don't pay full price, buy a plastic Clipper card and you only pay $4.85 a ride on the Sausalito ferry. You save $3.40 a ride or $4.40 a ride (when cash fare goes up $1 on August 1st). I'm sure they'd be surprised, and probably disappointed, maybe a little angry, but the "shock of their life" might be bit of an overstatement.